By the way, Summoner operates as either CLI or TUI application, so you can choose what you’re more comfortable with and install only the required one. cabal Bool Add Cabal support? stack Bool Add Stack support? license License One of: MIT, BSD2, BSD3, GPL-2, GPL-3, LGPL-2.1, LGPL-3, AGPL-3, Apache-2.0, MPL-2.0, None. ghcVersions [GHC] summoner uses default GHC-8.6.4. However, additionally you can specify other versions. For each version x.y.z the stack-x.y.z.yaml will be created. github Bool Turn on GitHub integration by default? lib Bool Create src folder with simple ProjectName.hs file and library target? exe Bool Create app folder with simple Main.hs file and executable target? test Bool Create test folder with simple Spec.hs file and test target? bench Bool Create benchmark folder with Main.hs file with gauge library usage example? extensions [Text] List of the default extensions to add into default-extensions section in the .cabal. ghc-options [Text] List of the default GHC options to add into ghc-options section in the .cabal. stylish. * Text stylish.file to provide the absolute file path OR stylish.url to download the .stylish-haskell.yaml file to use in the project. contributing. * Text contributing.file to provide the absolute file path OR contributing.url download OR contribuint.link to link the CONTRIBUTING.md file to use in the project. package Text The package name of the custom prelude you’d like to use in the project (doesn’t work without module field). module Text The module name of the custom prelude you’d like to use in the project (doesn’t work without package field). The TUI window opens with the pre-filled information received from a config file and command-line arguments. However, it’s possible to change any field as per your needs. In the screenshot you can see that you’ll be given a few text fields to fill in or some checkboxes that represent boolean values of the configurations. To help you fill in the correct input, there are some ⓘ info messages in the Status section, which give additional details about the current field. In CLI mode of operation Summoner asks about every project setting. Most of the questions contain a default value, so you can press Enter to choose the default value. If some option is specified via a configuration file or CLI arguments, then the question is skipped and the predefined value is used. 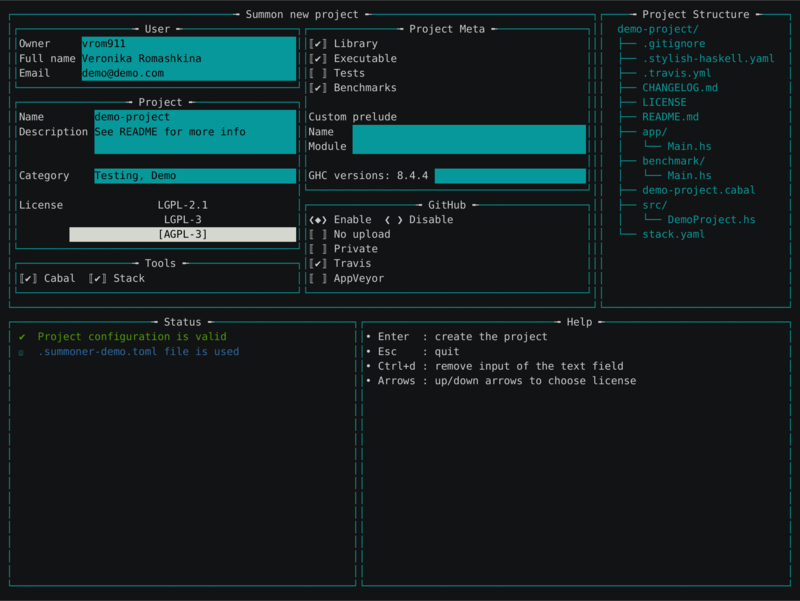 Summoner is a multi-package project which has two packages inside: summoner-cli and summoner-tui. We are supporting the same functionality in both of them, so, if it’s possible, you should add/change the code in both of the packages. On Linux, to build the summoner-tui you’ll need to have libtinfo installed. The easiest way to get this is from your system’s package manager and is usually available as the package libtinfo-dev. This project was inspired by Aelve/new-hs, which is the tool with the same goal but it’s only for creating cabal projects. summoner uses PVP Versioning. The changelog is available on GitHub. Include golden test files into extra-source-files. #285: Implement summon script command. #151, #295: Add support for GHC-8.6. Make GHC-8.6.4 default. #269: Important: Introduce ghc-options configuration parameter. Deprecate warnings field in TOML file. Migration guide: Please, rename warnings field if you use one, it will be removed in the very next release. Use ghc-options instead. #303: Add option noUpload to TOML config file. #280: Support build with cabal-install on the AppVeyor CI. #272: Simplify Travis config for Cabal. #275: Simplify Travis settings/installation process for Stack. #261: Guess author login, name and email from .gitconfig. #268: Simplify process of adding custom prelude in the interactive mode. #282: Allow users to extend the .gitignore file. #286, #288, #304: Bump up to tomland-1.0.0, relude-0.5.0, shellmet-0.0.1. Drop support for GHC-8.6.3 on CI. Support GHC-8.6.4 on CI. Make cabal-version: 2.0 default in generated projects. #199: Add None license with no LICENSE file generation. Add licenses short descriptions text during the interactive mode. Patch summon show license command to show short description about each license. #197 Build with stack lts-12.20, and support GHC 8.4.4 in project generation. Make GHC-8.4.4 the default one for generated project. #37: Add HLint check on Travis CI in generatd projects. #142: Add version bounds to base in the generated .cabal file. #239: Make categories not mandatory. Use defaultDescription for project description if not specified. #169: Make AppVeyor use the 64bits version of stack and build for 64 bits. #154: Add Link constructor to Source data type. #178: Remove unnecessary new lines and trailing spaces in most places. #168: Upgrade stack intall-cabal option’s version to 2.2.0.1 in the generated Travis file. #195: Update prompt questions for CLI. Add more documentation to the functions. #155: Bump up to tomland-0.5.0. #202: Bump up to relude-0.4.0. Remove tasty dependencies from tests. Drop support for GHC-8.6.1 on CI. Support GHC-8.6.2 on CI. Drop support for GHC-8.4.3 on CI. Build with GHC-8.4.4 on CI. Bump up relude version to 0.3.0. #109: Fix travis cache directories. #91: Add warning fields for ghc. #58: Make Licence type safer. 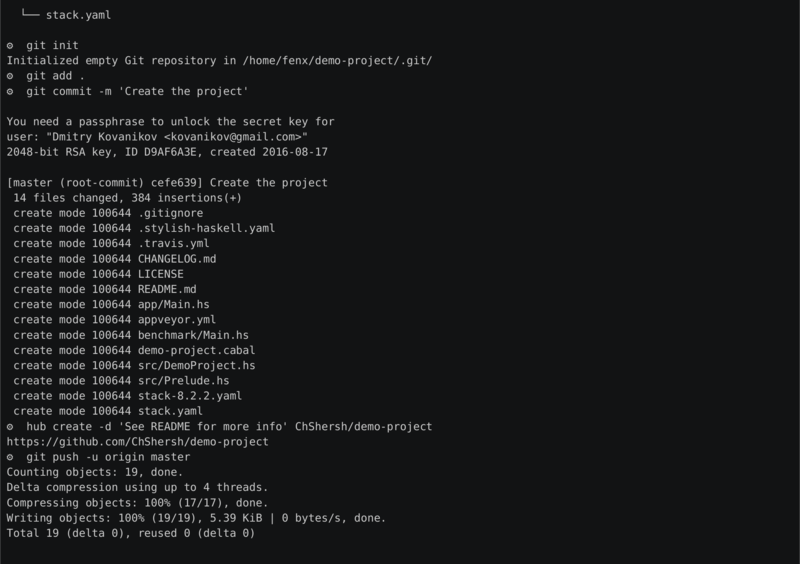 #130: Show git revision version under --version command. #63: Add show ghc, show license and show license <LICENSE_NAME> commands. #122: Remove github link from CHANGELOG when github is not chosen. #35: Add config option to add .stylish-haskell.yaml to your project (via URL or file path). Bump up tomland version to 0.4.0. #138: Remove traces of GitHub from .cabal file when GitHub integration is disabled. #31: Add config option to add CONTRIBUTING.md to your project (via URL or file path). Use relude instead of universum. #100: Bump up to ghc-8.4.3. Add support for Ghc843 in code and make it default. Make CI badges in README be shown depending on the chosen options. #99: UseTravis-specific env variable TRAVIS_BUILD_DIR in created travis file. #97: Add cabal to created travis file. #96: Add option to choose cabal, stack or both. Bump up tomland to version 0.3. #87: Fix Travis matrix for not default ghc versions. #85: Remove base-noprelude from dependencies. Important: Rename hs-init to summoner. Transform the script into the package. #54: Rename on and off commands to with and without. Add ability to write configurations file. Remove Targets data type. Use Config instead for default, file and CLI configurations. #60: Use custom prelude universum. #39: Add option to use custom prelude in CLI and in .toml configuration. #38: Add option to add default extensions to .toml config. #62: Make some parts of output not only colorful, but also bold. This makes output prettier. #67: Add Aswer data type to handle yes-no CLI questions. #61: Add CLI --version option. #73: Make custom prelude be table in toml. #74: Print hierarchy tree for the created project. #45: Support AppVeyor CI for created projects. Use metavar for on-off commands. Upgrade lts to 10.3, use ghc 8.2.2 as default value. #36: Add option for creating private repositories — -p | --private.